It has just been announced in a Central Bureau Electronic Telegram that Brian Marsden died this morning after contracting pneumonia on top of the leukemia he had been fighting this past year. 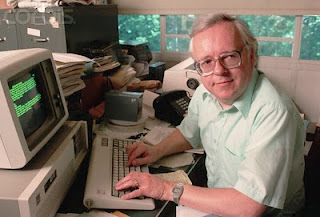 Central Bureau from 1968 to 2000 (and as Director Emeritus since then) and as Director of the Minor Planet Center from 1978 to 2006 (and as Director Emeritus since then). He also served extensively within Commissions 6 and 20 of the IAU over the years, being past President of both Commissions. And he was one of the most visible astronomers in the world over the years in terms of his generous availability to the news media on behalf of the astronomical community." Asteroid 1877 Marsden is named in his honor. "Dan Green, Director of the Central Bureau for Astronomical Telegrams, just called me (and issued the CBET below) to pass along the extremely sad news that Brian Marsden died this morning (November 18, 2010). He had been fighting leukemia and contracted pneumonia. Brian was a strong believer in the potential and power of amateur astronomers, and a real supporter of their serious efforts and contributions. From the 1960s on, he was a very good friend of the AAVSO and a close colleague, often asking for assistance to confirm or refute a discovery report before issuing an announcement, request follow-up observation information, or check on the behavior of a star in assessing a report made to the CBAT. Brian's breadth and depth of knowledge, professionalism, profound concern for the quality of science and information, charm and wit, and great kindness will be sorely missed. Our heartfelt sympathy goes to his wife, Nancy, his family, his assistant and colleague of over 30 years, Dan Green, and all those who worked with him or learned from him. For an excellent biography see the Minor Planet Center announcement . Oh man, Brian ... rest in peace. I kept telling people, you know, if you discovered a comet or asteriod that was going to destroy the Earth ... Brian was the man that would have figured the orbit and been on the front line of notifing the World, you're on short notice. Raising a toast of very expensive brandy (with a tasty cigar) to you, next observing session. Ad Astra!